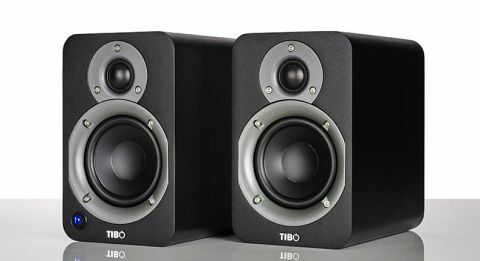 Tibo Plus 2 review | What Hi-Fi? The market is crawling with portable Bluetooth speakers around this price, but wireless desktop ones are thinner on the ground. There’s the Audio Pro Addon T8 (£250) and Ruark’s award-winning MR1s (£300), but nothing lower down the price ladder that we’d be thrilled to recommend. British company Tibo looks to change all that with its Plus 2s. In just five years it has built a decent catalogue of products from wireless and hi-fi speakers to AV stands and DJ equipment – and also distributes Swedish speaker brand Audio Pro in the UK. Many of them have pleasingly low prices too; we don’t see many brands with sub-£100 floorstanders in their ranges these days. The Plus 2s are compact, powered speakers that can play music over Bluetooth or directly from a stack of devices: smartphones, CD players, laptops, even televisions if you’re so inclined. That’s thanks to a hoard of connections bundled at the back of the active left speaker: there are two optical and one RCA and 3.5mm inputs, as well as a USB socket for charging portable devices (handy if your computer inputs are already occupied or your smartphone needs a quick charge). It connects to the right (passive) speaker via a rather lengthy wire, so they don’t have to be placed too close together. For a more tight-knit soundfield, however, they should be no more than 60cm apart. They would flank a computer monitor nicely, though if portability is a concern, the cabinets are compact enough to tuck under an arm. Ultimately with the design, it’s a case of getting what you pay for. Its traditional look is unassuming; the 2.5cm tweeter sits above a 10cm mid/bass driver, with just a handful of screws on an otherwise clean matt black fascia. The cabinets’ straight edges are a little sharp, so any fondling should be directed at their nicely tapered corners. We can excuse unspectacular remotes at this price, which should be solace for Tibo considering the Plus 2’s tiny credit card-style remote isn’t particularly nice to use. If one of the reasons nudging you towards bookshelves over punier portable speakers is power and volume, these newcomers won’t disappoint. Thanks to a wide spread of sound and the ability to go loud – maintaining good levels of clarity as we crank it up – they can happily fill a room. We occupy ours with everything from Genesis to John Legend, both over Bluetooth and connected via 3.5mm, and it doesn’t take long to work out these are musical performers: crisp, clean and snappy in their approach to the former’s catchy synth lines and latter’s piano-driven melodies. Detail isn’t lost on the Tibos. They offer good insight across the presentation, and traces of dynamic variation are easy to make out. Bass junkies can always take advantage of the subwoofer output to bring more bass onboard, but they are already fairly agile and punchy for their size. However, a lack of low-end control can see bass lines jumbling, rather than driving, a song’s rhythm though. After a few hours of running-in, they manage to keep a lid on their enthusiastic treble that’s so obvious cold from the box. We don’t expect much finesse at this price, but there’s room for more solidity and refinement. That’s true of the midrange also. Bob Dylan’s crooning vocals in Blowin’ In The Wind feel a little strained and coarse, while acoustic strings and harmonicas crave a tad more substance. The Tibo Plus 2s throw all their energy into delivering the basics – clarity, focus and imaging – and that’s what’s important at this price. For £150, these versatile wireless speakers are easy to consider.